For much of the 20th-century humans got really good at dam building. Dams—embraced for their flood protection, water storage, and electricity generation—drove industry, built cities and helped turn deserts into farms. The United States alone has now amassed more than 90,000 dams, half of which are 25 feet tall or greater. Today the American public is more discerning of dams’ benefits and more aware of their long-term consequences. In the past 30 years, 1,275 dams have been torn down, according to the nonprofit American Rivers, which works on dam-removal and river-restoration projects. Why remove dams? Some are simply old and unsafe—the average age of U.S. dams is 56 years. It would cost American taxpayers almost $45 billion to repair our aging, high-hazard dams, according to the American Society of Civil Engineers. In some cases it’s simply cheaper to remove them. Everglades National Park – More Freshwater (Not Less) Needed to Curb Algal Blooms in Everglades National Park’s Madeira Bay in Florida Bay. Photo: Steve Davis. WASHINGTON — A major scientific report issued by 13 federal agencies on Friday (Nov. 23) presents the starkest warnings to date of the consequences of climate change for the United States, predicting that if significant steps are not taken to rein in global warming, the damage will knock as much as 10 percent off the size of the American economy by century’s end. We know that climate change is altering rain and snowfall patterns worldwide but we are just beginning to understand the complex interactions among these changes and our land use habits. Protecting our waters from climate change means protecting the natural processes that keep them healthy. Mr. Trump has taken aggressive steps to allow more planet-warming pollution from vehicle tailpipes and power plant smokestacks, and has vowed to pull the United States out of the Paris Agreement, under which nearly every country in the world pledged to cut carbon emissions. On the morning of November 8, 2018, the Camp Fire erupted 90 miles (140 kilometers) north of Sacramento, California. 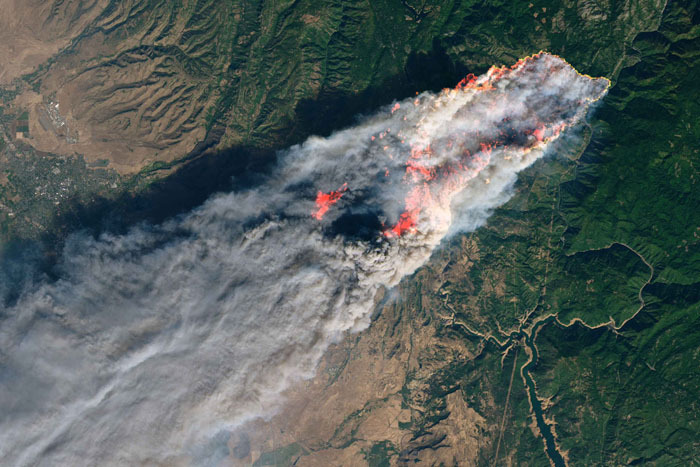 By evening, the fast-moving fire had charred around 18,000 acres and remained zero percent contained (photo: NASA Goddard Space Flight Center). So far over 70 dead and the 1,000 still missing. Adding to the numbers Woolsey Fire in Southern California. 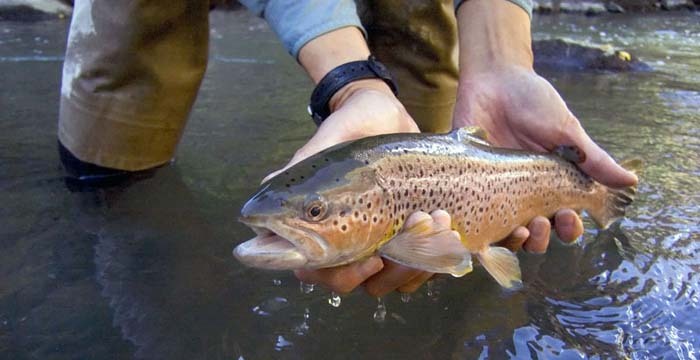 Wild and native fish depend on healthy watersheds. In many parts of the West, healthy watersheds evolved with frequent low-intensity fires that cleared out brush and recycled nutrients. Fires, when part of a healthy forest regimen, drop trees and woody debris into streams, creating ideal trout and salmon habitat. Hard to believe, but just a few weeks ago an Indian Summer produced days like those shown in this The Salty Fall Run Video by our advertiser 3 TAND REELS. Enjoy the last Long Island stripers of Novemebr 2018. Effective today, the Fly Fishing Show has launched its new information and schedule website. Just as individual raindrops build into a rushing river that carves through mountains and runs to the sea, you are an unstoppable force. This has been quite a year, thanks to supporters like you. You tore down dams, setting Maryland’s Patapsco River free. 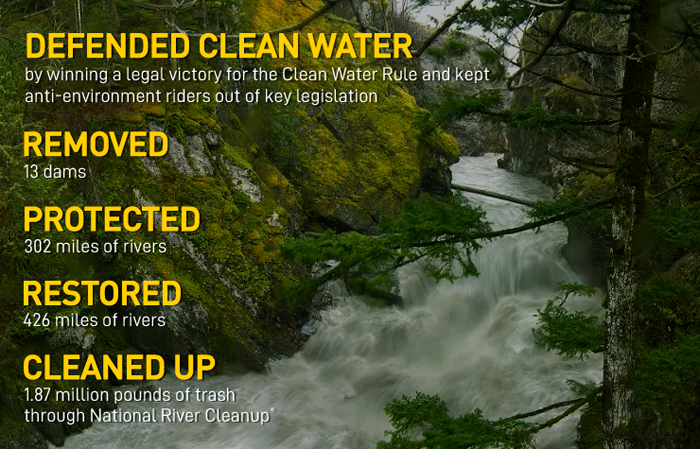 You protected rivers in Colorado and Washington from new dams and hydro projects. You preserved Montana’s East Rosebud Creek as Wild and Scenic, ensuring it flows freely for generations to come. You improved access to clean water in cities across the country. And that’s not all. You fought back, time after time, against the Trump administration’s attacks on our clean drinking water and public lands. 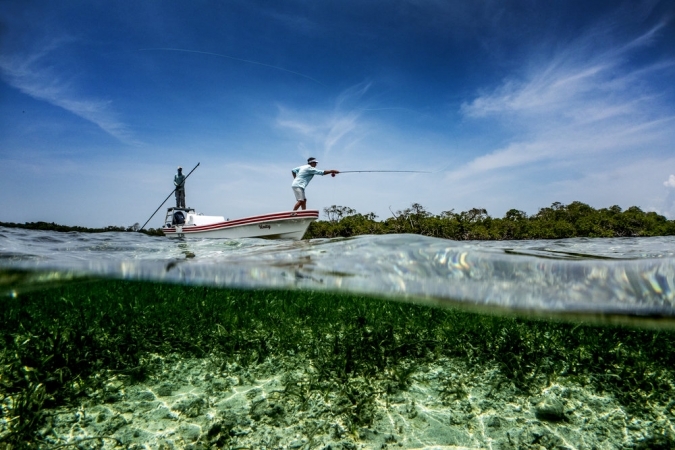 BTT Partners with Silver Kings, BTT Partners with Silver Kings, Tagged Tarpon Travels From Florida Keys to Maryland, BTT and SweetWater Collaborate for Conservation, Baker’s Cay Resort Key Largo Becomes Bronze Partner, Belize’s Cayo Rosario Under Threat, Win the Permit Fishing Trip of a Lifetime to Belize!, Nautilus Designs Custom BTT Tarpon Reel, and JOIN HERE . . .
Read newsletter . . .
Atlantic salmon are evolving rapidly, and the result is they are not growing as large as they used to. The effect has been traced to a single gene. Atlantic salmon (Salmo salar) hatch in rivers in Europe, where they spend their first few years before heading out to sea. Once they reach maturity, they return to their home river to breed. One such breeding ground is the Teno River, which forms the boundary between Norway and Finland. 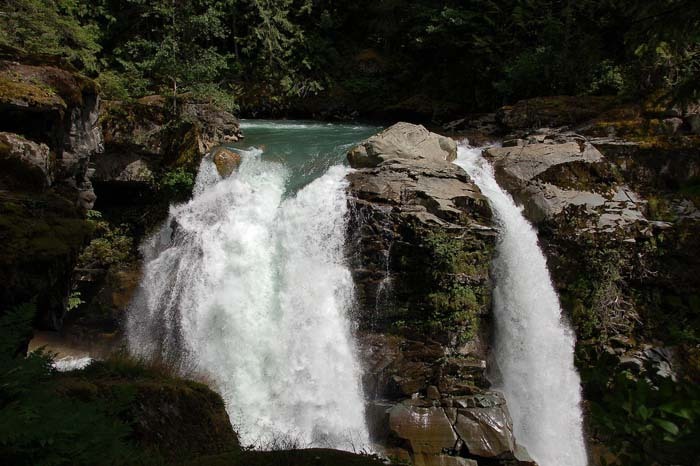 Since 1972, citizen scientists have collected samples of the salmon’s scales, which contain DNA. “We knew from our earlier research that the age at maturity had been decreasing over this period,” said Craig Primmer at the University of Helsinki in Finland. Mark Lane, executive director for the NAIA, doesn’t feel aquaculture has impacted wild salmon as much as people like to believe. “All Atlantic salmon rivers in Newfoundland and Labrador are in decline, and it’s been happening long before aquaculture and salmon farming ever existed,” he told The Central Voice. Lane said a moratorium was placed on the commercial Atlantic salmon fishery in 1992 because of poor stocks, but commercial aquaculture has only been in the province for 25 years. Furthermore, he said, it’s not just rivers near aquaculture operations showing decline based on the five-year average. Instead, Lane attributes other factors, including interceptor fisheries (domestic and foreign), seals, retention angling, poaching and a changing climate, for the declines. No Grazing in Grand Staircase-Escalante! Sign petition to support Keep Grazing Free in Grand Staircase-Escalante. There is a serious problem in BLM’s new plan for the Grand Staircase Escalante National Monument. This is a case where retired grazing leases from willing ranchers is being trashed by this administration. There is a serious problem in BLM’s new plan for the Grand Staircase Escalante National Monument. This new plan will introduce cattle into the Escalante River canyons, long closed to livestock grazing. In 1999, BLM closed these canyons to grazing as a result of a buyout of grazing permits by the Grand Canyon Trust. Now that agreement will be tossed as the BLM makes available these canyons to graze. The Escalante River canyons are one of the most popular recreation places for hikers and backpackers in the country. The absence of cattle coupled with a major effort to remove Russian olive (an exotic invader) has lead to an incredible ecological recovery. This is about to be reversed as BLM tries to make available more than 96% of this monument to grazing, including 30 miles of river bottom that are critical habitat and incredibly popular areas for hiking and camping. Mom, Dad here’s a chance to put “our” money where your mouth is, and we’re all for it! 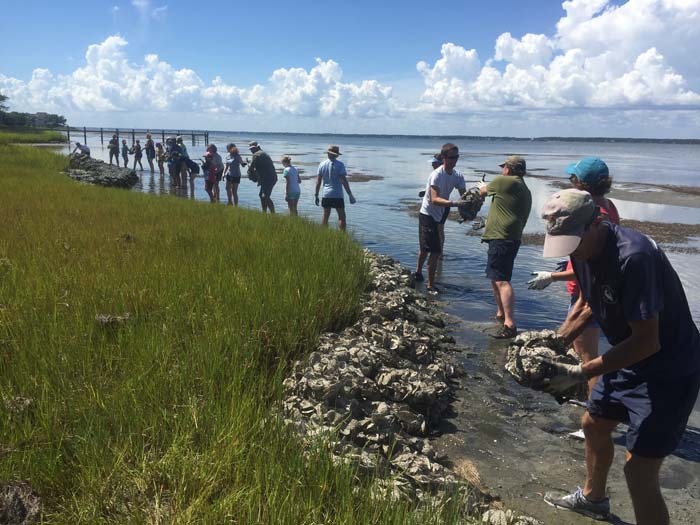 Volunteers work on a community-based oyster restoration project in North Carolina. NOAA image. Six million dollars in Community-based Restoration Program funding available for coastal and marine habitat restoration in 2019. NOAA Seeks Applications for Community-based Habitat Restoration Project Funding. New for this funding opportunity is the requirement of a pre-proposal. The pre-proposal process will help determine if proposed projects are well-suited for this specific funding competition and if a full proposal is warranted. Pre-proposals are due January 14, 2019. The full proposal deadline in April 2019 will be sent to eligible applicants that were successful in the pre-proposal process. NOAA will not accept proposals with a federal funding request of less than $75,000 or more than $3 million over a three year project period. For more information visit the Fiscal Year 2019 Coastal and Marine Habitat Restoration Grants funding opportunity.